Knowing how to read a map as well as use a compass to stay on course are skills that are dying with each generation of hikers and campers, as technology makes finding your way easier and easier. Well, in fact, they’re considered as necessary backups to ensure that you can find your way home if you ever get lost or lose your electronic guidance systems. However, another key part of being able to get back home is to own a compass that is accurate and works well. One of the affordable options available in the market is the Ueasy Professional Compass, which is a good choice for hikers who want a reliable tool. Let’s examine this particular compass in more detail and find out if it can keep you good in your time of need. Now that you’ve had a chance to get the basic overview of the Ueasy Professional compass, let’s take time to break down some of its key features, positive or otherwise, so that you can decide if this compass is the right choice for your specific needs. A common feature that many compasses have that doesn’t get overlooked here is the illuminated back panel. If you keep the compass in the sunlight during the day or expose it to the light of a flashlight, the back panel of the compass wall will illuminate. The illumination level provided at night will allow you to read the compass without a lamp. Another standout feature of this compass is the sighting lines and sighting window. Many compasses do not include these features, but you can do fairly accurate sighting with this compass. What is more ideal is that the included reference table will make it easy to figure out scales and distances even if you don’t have much previous practice with using sighting lines. The problem with this product is the included instruction manual. 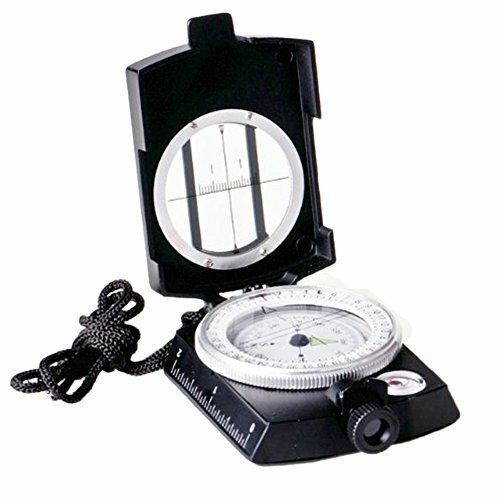 It simply isn’t a good tool for beginners to rely on to learn how to use their compass. If you already really know how to use this type of compass correctly, the manual will be unnecessary. But for those who are getting this compass as their first one, you will need an instructor to learn how to use it effectively. This model is made from premium metal products, and you can get it in three different colors including black, camouflage, and green. While the material used does make the compass heavy, it also makes it incredibly durable. You’ll find that even throughout many uses, this compass will not be damaged at all. For some, this might be the only compass that they would ever need for their entire lives, assuming it is looked after and kept in good condition. The main drawback that you’ve probably already noticed is the weight of this compass. It comes in at about seven ounces, which is quite a lot of weight to add to your pack if you have a lot of other necessary tools, so you will want to consider this before purchasing it. It’s also quite bulky in relative terms, say to a standard and basic plastic compass. There is no doubt that you want a compass that can point you not just in any direction, but in the right direction! Fortunately, this compass from Ueasy is very accurate since the needle finds magnetic North very quickly and rotates to stick to it even if you move around quickly. When leveled correctly, you can expect it to spin into place in seconds. The sight lines are also relatively accurate, allowing for easy reading of distances while you are out on the trail. Unfortunately, this compass doesn’t really offer any bonus features that you cannot find on any affordable compass. In fact, it’s very similar to many others on the market. The main difference that makes this compass standout is its casing, which is nice, but not everyone will want something so heavy just to protect their compass. While the Ueasy Professional Compass is a great choice, it’s not going to be the right fit for everyone, and we understand that many hikers will want something that is more lightweight. One such option would be the Suunto A-30 compass, a basic but very functional compass. The Suunto A-30 compass weighs in at a lightweight 0.3 ounces, but it doesn’t have the same level of housing protection and so could suffer in terms of durability because of it. While the Ueasy compass is made from durable, heavy, metal parts, the Suunto A-30 is made from plastic parts, that may break more easily. Hence, you will have to decide if you care more about weight or durability as that is the primary concession to be made between these two otherwise comparable models. Overall, the Ueasy Professional Multifunction Compass is a great option for hikers who don’t mind a little extra weight as long as they have a very durable compass. This compass is housed in a sturdy, well-designed case that, while heavy, ensures that the components of the compass will work for many years to come. Whether your pack gets a bit wet or shaken around on your journey, this compass will likely not be affected. For its good price, high durability, and overall accurate readings, the Ueasy Professional Multifunction Compass is a great pick for many intermediate hikers looking to expand their tool range or those who want a solid compass that they can rely on even during the most difficult treks. Therefore, if you want a simple yet effective compass, this is a perfect choice for you. We hope you found this deep dive look into the Ueasy Professional Multifunction Compass useful and informative. There are a wide range of compasses to choose from on the market, with all sorts of options ranging from the basic to the considerably complex. Whatever you choose to go with, learning how to use a compass and a map is a really useful skill to have if you plan to do any significant amount of hiking. Relying on technology can be risky, as Murphy’s law will attest, when you need it most, is when it will likely tend to stop working on you. Learning how to read maps and navigate with a compass is also a fun thing to do, so it is actually enjoyable to learn as well as being very useful.